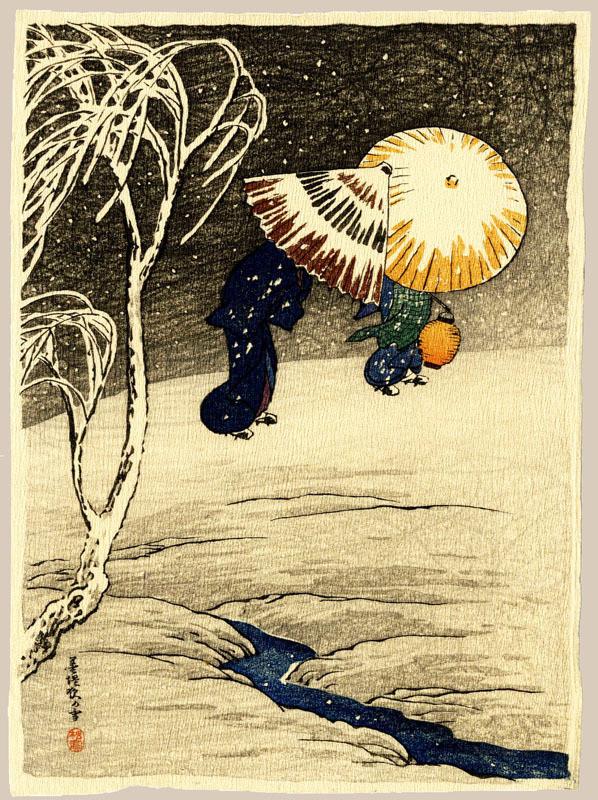 Shotei, Takahashi (1871 - 1945), "Night Snow at Riverside"
Notes: This is the actual example used on Shotei.com reference site. Near pristine example. Exceedingly scarce pre-earthquake snow design. Provenance: Comes from a private collection; stored in folder and never displayed. Chirimen-gami-e ("crepe paper") were crinkled paper prints, sometimes referred to as 'crepon'. Ukiyo-e crepe prints were produced at least as early as 1800 in Edo, and throughout the nineteenth century they were used on occasion for alternate states of some ukiyo-e designs. The compression technique resulted in a highly textured surface and slightly smaller paper size.